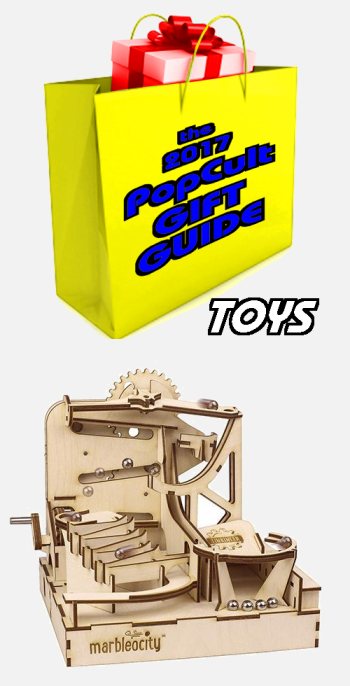 Today’s toy pick for the 2017 PopCult Gift Guide is actually an entire line of really cool toys that I’ve liked since I saw them at the New York International Toy Fair in 2016. Marbleocity is a line of laser-cut wooden STEM kits made in the USA. The toys take STEM to a new level by bringing real fun to hands-on learning. This is the perfect educational gift for tweens and teens on your holiday shopping list who may not even realize that they’re learning while they play. With Marbleocity, kids will enjoy building skate parks and roller coasters. While doing this they are exposed to physics concepts and engineering principles in an engaging format. When they’re finished, the intricate and beautiful designs of each module and working marble run feature make it an awesome toy and kinetic sculpture. Each set comes with a comic that serves as instructions for how to build the set, and also imparts the knowledge behind how each set works. It’s not intimidating for children to learn about roller coaster design, conservation of energy, projectile motion or centripetal force when a character is taking them through the concepts in a fun and relatable way. With Marbleocity, kids are engineers, scientists, mathematicians and more, all the while enjoying the experience. And in the end, they’ve learned something and have a cool marble run. There are currently four different models in the Marbleocity line with more planned. All sets are made of laser-cut Baltic Birch and do not require batteries. They range in price from thirty to sixty dollars, but some retailers are discounting them so you might want to shop around. The toys look fantastic, with a Steampunk feel as wood and marbles collide to create living art. The Mini Coaster is for the beginner. They can build a wild ride full of dips and turns, and learn some engineering and physics along the way. This set takes about an hour to build. It consists of over 30 laser-cut wood parts and is recommended for ages nine and up. Once they master the Mini Coaster, they can take on The Dragon Coaster and construct their own wooden roller coaster, again with plenty of dips and turns, and steeper, higher, more complicated angles and trajectories. The Dragon Coaster is inspired by the real wooden roller coaster of the same name, located at Playland in Rye, NY. This set consists of over 80 laser-cut wooden parts and is recommended for ages twelve and up. The Mini Skate Park crams a lot of physics action in a small space. Builders can make a stair descent, rail slide and jump. With this set, the marbles get air. A multi-gear left gets the marbles into position to take the jump before hitting the stairs and rail slide. This set consists of over 30 laser-cut wood parts and is recommended for ages nine and up. Finally we have the full Skate Park set, which highlights the physics of skateboarding with a half-pipe, stair descent, rail slide and…an even bigger jump! This module can stand on its own or adjoin the Dragon Coaster module to allow circulation of marbles between the two. It consists of over 80 laser-cut wooden parts and is suitable for ages twelve and up. Marbleocity can be found at many toy and game retailers, or at Amazon, and has it’s own website starring the feature characters in the comics, The Tinkineers. It’s a great gift for kids, and can teach them the basics of physics and engineering, and it also works as a stress-relieving project for adults who need a release from the everyday worries of life.